Martyrs Mirror: The Story of Seventeen Centuries of Christian Martyrdom From the Time of Christ to A.D. 1660 est le grand livre que vous voulez. Ce beau livre est créé par Thieleman Van Bragt. En fait, le livre a 1158 pages. 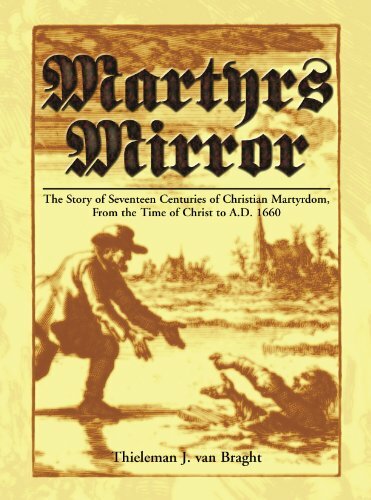 The Martyrs Mirror: The Story of Seventeen Centuries of Christian Martyrdom From the Time of Christ to A.D. 1660 est libéré par la fabrication de Herald Press. Vous pouvez consulter en ligne avec Martyrs Mirror: The Story of Seventeen Centuries of Christian Martyrdom From the Time of Christ to A.D. 1660 étape facile. Toutefois, si vous désirez garder pour ordinateur portable, vous pouvez Martyrs Mirror: The Story of Seventeen Centuries of Christian Martyrdom From the Time of Christ to A.D. 1660 sauver maintenant. Classic graphic accounts of more than 4,000 Christians who endured suffering, torture, and a martyr's death because of their simple faith in the gospel of Christ. Includes more than 50 finely detailed etchings by noted Dutch artist Jan Luyken. Songs, letters, prayers, and confessions appear with the stories of many defenseless Christians who were able to love their enemies and return good for evil.